Prominent & Leading Producers from Mumbai, we offer digital temperature controller, digital temperature controllers, programmable temperature controllers (single display), hand held digital temperature indicator, thermocouple or rtd input controller and 4 & half digit process indicator with alarms. 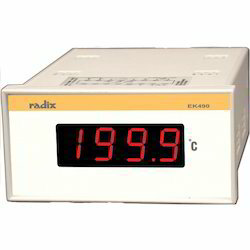 Digital Temperature Controllers, EK451 is a Digital Temperature Indicator and Controller. Its single input accepts J-type (Iron/Constantan) and K-type (Chromel/Alumel) thermocouples, Pt100 RTD and linear (millivolt or milliamp) input. A large LED display on the front of the unit indicates either the process value or user-defined set point, which is easily programmed via a 10-turn trim pot. EK451’s single electromagnetic relay triggers heating, cooling, or high and low alarms for its single set point.This is a highly accurate controller, with an error as low as 1% for thermocouples and no more than 0.1% for linear output. EK451 is conventionally an ON-OFF controller that outputs a discrete signal, but can also be used in Time-Proportioning Mode which turns the actuator on and off for periods proportional to the desired control effort, to emulate a continuous actuator that can generate a control effort between 0 and 100%.It also retransmits an isolated output signal to other devices such as a Programmable Logic Controller (PLC) or Solid-State Relay (SSR). Signal isolation protects your devices and machines downstream of our instruments from damaging fluctuations in the input signal. By including input terminals in the excitation loop, EK451 provides power for two-wire 4-20 transmitters. The controller’s modular design contains zero-wiring making it virtually shockproof. 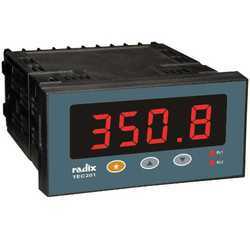 Digital Temperature Controllers, EK452 is a Digital Temperature Indicator and Controller. Its single input receives J-type (Iron/Constantan) and K-type (Chromel/Alumel) thermocouples, Pt100 RTD and linear (millivolt or milliamp) input. A large LED display on the front of the unit indicates either the process value or user-defined set point, which is easily programmed via the membrane keys on the front of the unit or a 10-turn trim pot. EK452’s 2 electromagnetic relays trigger heating, cooling, or high and low alarms for its 2 set points. This is a highly accurate controller, with an error as low as 0.1% for linear inputs and no more than 1% for thermocouples. EK452 is conventionally an ON-OFF controller that outputs a discrete signal, but can also be used in Time-Proportioning Mode which turns the actuator on and off for periods proportional to the desired control effort, to emulate a continuous actuator that can generate a control effort between 0 and 100%.It also retransmits an isolated output signal to other devices such as a Solid-State Relay (SSR) or Programmable Logic Controller (PLC). Signal isolation protects your devices and machines downstream of our instruments from damaging fluctuations in the input signal. By including input terminals in the excitation loop, EK452 provides power for two-wire 4-20 transmitters. The controller’s modular design contains zero-wiring making it virtually shockproof. Programmable Temperature Controllers EC396 is a cost-effective programmable temperature controller. It accepts J-type (Iron/Constant) and K-type (Chromel/Alumel) thermocouples as well as Pt100 RTD inputs. Individual LEDs indicates relay status as well as process values. Buttons on the front of EC396 allow operators to easily program 1 set point for the process value. Typically, readings have an error of ± 1 °C. This controller has 1 electromagnetic relay that triggers heating or cooling. 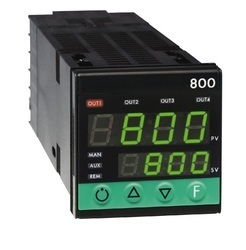 EC396 is conventionally an ON/OFF controller that outputs a discrete signal, but can also be used in Time-Proportioning Mode which turns the actuator on & off for periods proportional to the desired control effort, to emulate a continuous actuator that can generate a control effort between 0 and 100%. DIGIRAD71 is a hand held digital thermometer equipped with a K-type thermocouple temperature sensor.Radix also supplies a wide range of alternative probes for this instrument such as general purpose, quick response, high temperature and Teflon coated immersion probes; bow-curved, leaf, rotary and spring surface probes; needle probes, prick probes, air probes and smithy probes. Its temperature range is between -50° C and 1300° C with a resolution of 0.1°C. It typically runs for 100 hours on a full charge of its standard 9V carbon-zinc battery. A large 3.5 digit LCD display shows your reading. The thermometer is accurate to within 1°C of the true value. DIGIRAD71 indicates a temperature out of its range or a sensor-break with the number 1 and low-battery by a ‘BAT’ on its display. DIGIRAD71 may be fitted with a large variety of probes depending upon application. EC348 is a cost-effective programmable temperature controller with a single Thermocouple or RTD input and 1 relay output with user-specified control action and relay logic. It accepts J-type (Iron/Constantan) and K-type (Chromel/Alumel) thermocouples as well as Pt100 RTD inputs. A single LED display shows the process value and an additional LED indicates relay status. Operators easily program 1 setpoint via membrane buttons on the front of EC348. With an error of only 0.1% of the full-scale, this is a process controller of superior accuracy. Typically, readings have a maximum error of ± 1 °C. The controller has 1 electromagnetic relay that triggers heating or cooling. EC348 is conventionally an ON-OFF controller that outputs a discrete signal, but can also be used in Time-Proportioning Mode which turns the actuator on and off for periods proportional to the desired control effort, to emulate a continuous actuator that can generate a control effort between 0 and 100%. 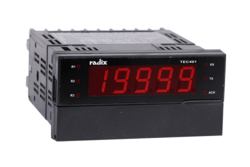 TEC401 is a 4 1/2 digit process indicator with alarms. It receives input from 14 types of thermocouples , Pt100 3-wire RTD sensors, mV, 0-10 V DC, 4-20 mA or 0 - 20 mA linear inputs. 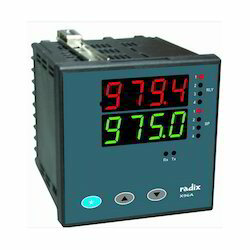 A five digit 0.56” LED display on the front of the indicator indicates the process value while 6 additional LEDs indicate the status of upto four alarms and RS485 status. 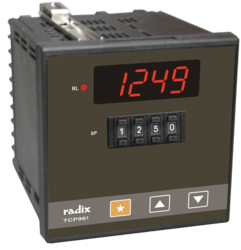 Operators can easily program up to 4 setpoints for the process value via membrane buttons on the front of TEC401. With an error of only 0.1% of full-scale value, this is an indicator of superior accuracy. TEC401's 4 electromagnetic relays trigger full-scale high and low alarms,deviations and band alarms . It also retransmits an isolated current or voltage output signal to other devices such as a Programmable Logic Controller (PLC). Signal isolation protects your devices and machines downstream of our instruments from damaging fluctuations in the input signal. TEC401 has an option of isolated RS485 output for serial communication with the PC. It has an added feature of displaying peak and valley values of the process. TEC401 also has a digital input feature which can be programmed to function as an alarm acknowledge or to reset the peak/valley values. TEC401 is password protected for programming paramaters . It is failsafe for sensor break. The enclosure is a plug-in design, measuring 48x96x112 mm. EC48 is a cost-effective programmable temperature controller. It accepts J-type (Iron/Constantan) and K-type (Chromel/Alumel) thermocouples as well as Pt100 RTD inputs. A large LED dual-display on the front of the process controller shows the difference in values of the setpoint and process value while 2 additional LEDs indicate the status of each of the two relays. Buttons on the front of EC48 allow operators to easily program up to 2 setpoints for the process value. With an error of only 0.1% of the full-scale, this is a process controller of superior accuracy. Typically, readings have a maximum error of ± 1 °C. The controller has 2 electromagnetic relays that trigger heating or cooling. EC48 is conventionally an ON-OFF controller that outputs a discrete signal, but can also be used in Time-Proportioning Mode which turns the actuator on and off for periods proportional to the desired control effort, to emulate a continuous actuator that can generate a control effort between 0 and 100%. 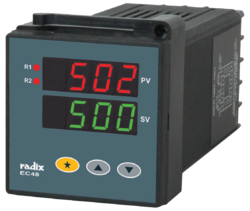 This product features Radix's proprietary sensor-break indication technology. 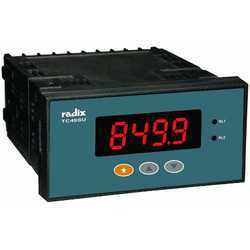 Radix Manufactured Digital Temperature Controller series is a range of full-featured ON-OFF Controllers. 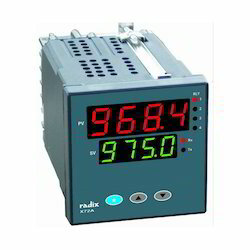 Some Digital Temperature Controllers features an extra large 0.8” (20.3mm) display for the Process Variable. The large number of programmable parameters allows the user to configure the instrument as required for any application. These controllers are also available in flameproof versions. The X96Delta model has special functions such as difference and average, and features a 3-row display. Available in 5 DIN sizes, from 48x48 to 96x96. 1 or 2 universal inputs are available, and include 8 thermocouple types, RTD Pt100, 4 to 20 mA, 0 to 50 mV, and 0 to 1/5/10 VDC. Up to 4 relay outputs rated at 5A/230 VAC. 1 or 2 isolated analog outputs (4 to 20 mA, 0 to 10 V, etc) can also be given. For communication, an isolated RS485/MODBUS RTU is provided. 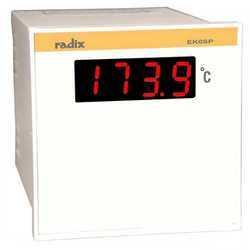 Digital Temperature Controllers, EK4SP, is a Digital Temperature Indicator and Controller. It accepts J-type (Iron/Constantan) and K-type (Chromel/Alumel) thermocouples as well as Pt 100 RTD inputs. A large LED display on the front of the unit indicates either the process value or user-defined set point, which is easily programmed via a 10-turn trim pot. EK4SP’s 4 relays can trigger heating, cooling, or high and low alarms for its 4 set points. This is a highly accurate controller, with an error as low as 0.1% for linear inputs and no more than 1% for thermocouples. EK4SP is conventionally an ON-OFF controller that outputs a discrete signal, but can also be used in Time-Proportioning Mode which turns the actuator on and off for periods proportional to the desired control effort, to emulate a continuous actuator that can generate a control effort between 0 and 100%. It also retransmits an isolated output signal to other devices such as a Programmable Logic Controller (PLC) or Solid-State Relay (SSR). Signal isolation protects your devices and machines downstream of our instruments from damaging fluctuations in the input signal. By including input terminals in the excitation loop, EK4SP provides a power supply for two-wire 4-20 transmitters. Zero wiring required due to the controller's modular design, thereby making it virtually shockproof. Digital Temperature Controllers, EK0SP is a Digital Temperature Indicator accepting J and K type thermocouples, Pt100 RTDs, millivolt and 4 - 20 mA current input. The large 3½-digit display indicates process temperature. EK0SP is accurate to 1% for thermocouples, 0.2% for RTDs and 0.1% for linear (current or voltage) input. The indicator has zero wiring, a very reliable and stable design. 0jIt also retransmits an isolated output signal to other devices such as a Solid-State Relay (SSR) or Programmable Logic Controller (PLC). By including input terminals in the excitation loop, EK0SP provides power for two-wire 4-20 transmitters. Digital Temperature Controllers.EK490 is a Digital Temperature Indicator accepting Pt100 RTDs, J and K type thermocouples, millivolt and 4 - 20 mA current input. The large 3½-digit display indicates process temperature. EK490 is accurate to 1% for thermocouples, 0.2% for RTDs and 0.1% for linear (current or voltage) input. The indicator has zero wiring, a very reliable and stable design. It retransmits a 4 - 20 isolated output. Signal isolation protects your devices and machines downstream of our instruments from damaging fluctuations in the input signal. By including input terminals in the excitation loop, EK490 provides power for two-wire 4-20 transmitters. X49A is an ON OFF controller. It can be factory-programmed for either of two input groups. Group 1 contains 8 types of thermocouples (B, E, J, K, N, R, S, T), Pt100 RTDs and 0/4-20 mA and 0-50 mV linear inputs. Group 2 contains 11 types of thermocouples (B, C, D, E, G, J, K, N, R, S, T), Pt100 and Cu53 RTDs, 0/4-20 mA and 0-50 mV linear inputs. A large LED dual-display on the front of the controller shows the difference in values of the setpoint and process value while 4 additional LEDs indicate the state of up to 4 relays. Operators to easily program up to 4 setpoints via membrane buttons on the front of X49A. With an error of only 0.1% of the full-scale, this is a process controller of superior accuracy. X49A's electromagnetic relays trigger heating, cooling or any of 6 types of alarms - full-scale high/low, deviation high/low, inband and outband. It also retransmits an isolated 0/4-20 mA or 0-10 V DC output signal to other devices such as a Programmable Logic Controller (PLC) or Solid-State Relay (SSR). Signal isolation protects your devices and machines downstream of our instruments from damaging fluctuations in the input signal. By including input terminals in the excitation loop, X49A provides power for 2-wire 4-20 mA transmitters. Programmable Temperature/Process Controllers X96A is an ON-OFF controller. It receives 2 universal inputs which can be factory-programmed for either of two groups. It accepts input from 8 types of thermocouples (B, E, J, K, N, R, S, T), Pt100 3-wire RTD sensors and optionally, 0 - 20 mA linear inputs and 4-20 mA or 0 - 10 V DC. Group 2 contains 11 types of thermocouples (B, C, D, E, G, J, K, N, R, S, T), Pt100 and Cu53 RTDs, 0/4-20 mA and 0-50 mV linear inputs. A large LED dual-display on the front of the controller shows the difference in values of the set point and process value while 10 additional LEDs indicate the state of each relay, set points and Auto/Manual status. Operators to easily program up to 4 set points via membrane buttons on the front of X96A. With an error of only 0.1% of the full-scale, this is a process controller of superior accuracy. X96A's electromagnetic relays trigger heating, cooling or any of 6 types of alarms - full-scale high/low, deviation high/low, in band and out band. It also retransmits an isolated 0/4-20 mA or 0-10 V DC output signal to other devices such as a Programmable Logic Controller (PLC) or Solid-State Relay (SSR). Signal isolation protects your devices and machines downstream of our instruments from damaging fluctuations in the input signal.X96A provides power for 2 - wire 4-20 mA transmitters, by including input terminals in the excitation loop. Process Controllers, X48A is an ON-OFF controller. It can be factory-programmed for either of two input groups. Group 1 contains 8 types of thermocouples (B, E, J, K, N, R, S, T), Pt100 RTDs and 0/4-20 mA and 0-50 mV linear inputs. Group 2 contains 11 types of thermocouples (B, C, D, E, G, J, K, N, R, S, T),Pt100 and Cu53 RTDs, 0/4-20 mA and 0-50 mV linear inputs. A large LED dual-display on the front of the PID controller shows the difference in values of the set point & process value while 3 additional LEDs indicate the state of each relay as well as Auto/Manual status. Our Process Controller has ,membrane buttons on the front of X48A allow operators to easily program up to 3 set points.With an error of only 0.1% of the full-scale, this is a process controller of superior accuracy. X48A's electromagnetic relays trigger cooling, heating or any of 6 types of alarms - full-scale high/low, in band and out band, deviation high/low. It also retransmits an isolated 0/4-20 mA or 0-10 V DC output signal to other devices such as a Programmable Logic Controller (PLC) or Solid-State Relay (SSR). Signal isolation protects your devices and machines downstream of our instruments from damaging fluctuations in the input signal. By including input terminals in the excitation loop, X48A provides power for two-wire 4-20 transmitters. Programmable Temperature/Process Controllers, X72A, is an ON-OFF controller. It can be factory-programmed for either of two input groups. Group 1 contains 8 types of thermocouples (B, E, J, K, N, R, S, T), Pt100 RTDs and 0/4-20 mA and 0-50 mV linear inputs. Group 2 contains 11 types of thermocouples (B, C, D, E, G, J, K, N, R, S, T), Pt100 and Cu53 RTDs, 0/4-20 mA and 0-50 mV linear inputs. A large LED dual-display on the front of the controller shows the difference in values of the set point and process value while 6 additional LEDs indicate the state of upto 4 relays, set points and Auto/Manual status. Operators to easily program up to 4 set points via membrane buttons on the front of X72A. With an error of only 0.1% of the full-scale, this is a process controller of superior accuracy. X72A's electromagnetic relays trigger heating, cooling or any of 6 types of alarms - full-scale high/low, deviation high/low, in band and out band.This also retransmits an isolated 0-10 V DC or 0/4-20 mA output signal to other devices such as a Solid-State Relay (SSR) or Programmable Logic Controller (PLC). Signal isolation protects your devices and machines downstream of our instruments from damaging fluctuations in the input signal. By including input terminals in the excitation loop, X72A provides power for 2-wire 4-20 mA transmitters. Programmable Temperature Controllers, TC 49SU, is a mid-range programmable temperature controller; feature-rich and cost-effective at the same time. It accepts input from 8 types of Pt100 3-wire RTD sensors, thermocouples (B, E, J, K, N, R, S, T) and optionally, 0 - 10 V DC and 4-20 mA or 0 - 20 mA linear inputs. 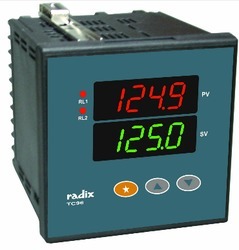 A large LED display on the front of the temperature controller indicates the process value while 2 additional LEDs indicate the status of each of the two relays. Buttons on the front of TC49SU allow operators to easily program up to 2 set points for the process value. With an error of only 0.1% of full-scale value, this is a temperature controller of superior accuracy. TC49SU's two electromagnetic relays trigger heating, cooling or full-scale high and low alarms. It also retransmits an isolated current or voltage output signal to other devices such as a Programmable Logic Controller (PLC) or Solid-State Relay (SSR). Signal isolation protects your devices and machines downstream of our instruments from damaging fluctuations in the input signal. TC49SU is conventionally an ON-OFF controller that outputs a discrete signal, but can also be used in Time-Proportioning Mode which turns the actuator on and off for periods proportional to the desired control effort, to emulate a continuous actuator that can generate a control effort between 0 & 100%. 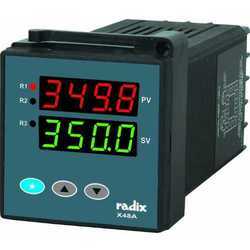 This product features Radix's proprietary sensor-break indication technology. Programmable Temperature Controllers, TCP961 is a mid-range programmable temperature controller; feature-rich and cost-effective at the same time. Designed specifically for applications requiring frequent set point changes, TCP961 features a push wheel switch on the front of the unit. It accepts input from 8 types of Pt100 3-wire RTD sensors, thermocouples (B, E, J, K, N, R, S, T), 0 - 10 V DC and 4-20 mA linear inputs. A single LED display shows the process value & 1 additional LED indicates relay status. Via the push wheel switch, operators can program 1 set point for the process value within seconds! With an error of only 0.1% of full-scale value, this is a temperature controller of superior accuracy. Typically, readings have an error of ± 1 °C. TCP961's electromagnetic relay triggers heating, cooling or full-scale high & low alarms. It also retransmits an isolated output signal to other devices such as a Programmable Logic Controller (PLC) or Solid-State Relay (SSR).Signal isolation protects your devices & machines downstream of our instruments from damaging fluctuations in the input signal. TCP961 is conventionally an ON-OFF controller that outputs a discrete signal, but can also be used in Time-Proportioning Mode which turns the actuator on and off for periods proportional to the desired control effort, to emulate a continuous actuator that can generate a control effort between 0 and 100%. 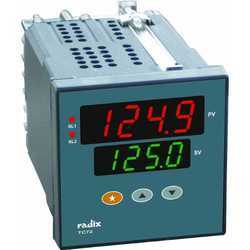 This product features Radix's proprietary sensor-break indication technology. 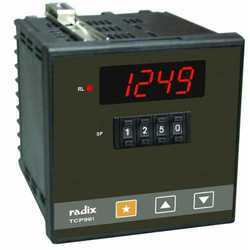 Programmable Temperature Controllers EC48 is a cost-effective programmable temperature controller. Buttons on the front of EC48 allow operators to easily program up to 2 set points for the process value. Typically, readings have a maximum error of ± 1 °C.The controller has 2 electromagnetic relays that trigger cooling or heating. EC48 is conventionally an ON-OFF controller that outputs a discrete signal, but can also be used in Time-Proportioning Mode which turns the actuator on and off for periods proportional to the desired control effort, to emulate a continuous actuator that can generate a control effort between 0 & 100%. Programmable Temperature Controllers, is a mid-range programmable temperature controller; feature-rich and cost-effective at the same time. It receives input from 8 types of thermocouples (B, E, J, K, N, R, S, T), Pt100 3-wire RTD sensors and optionally, 0 - 10 V DC and 4-20 mA or 0 - 20 mA linear inputs. A large LED dual-display on the front of the temperature controller shows the difference in values of the set point and process value while 2 additional LEDs indicate the status of each of the two relays. Buttons on the front of TC96 allow operators to easily program up to 2 set points for the process value. 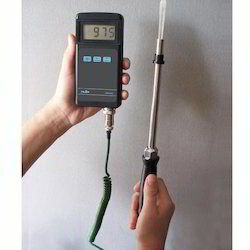 With an error of only 0.1% of full-scale value, this is a temperature controller of superior accuracy. TC96's electromagnetic relays trigger heating, cooling or full-scale high and low alarms.It also retransmits an isolated output signal to other devices such as a Solid-State Relay (SSR) or Programmable Logic Controller ( PLC ). Signal isolation protects your devices and machines downstream of our instruments from damaging fluctuations in the input signal. TC96 is conventionally an ON-OFF controller that outputs a discrete signal, but can also be used in Time-Proportioning Mode which turns the actuator on and off for periods proportional to the desired control effort, to emulate a continuous actuator that can generate a control effort between 0 and 100%. 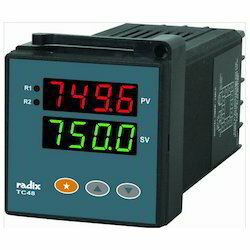 This product features Radix's proprietary sensor-break indication technology. TCP961 is a mid-range programmable temperature controller; feature-rich and cost-effective at the same time. Designed specifically for applications requiring frequent set point changes, TCP961 features a push wheel switch on the front of the unit. It accepts input from 8 types of thermocouples (B, E, J, K, N, R, S, T), Pt100 3-wire RTD sensors, 0 - 10 V DC and 4-20 mA linear inputs. A single LED display shows the process value and 1 additional LED indicates relay status. Via the push wheel switch, operators can program 1 set point for the process value within seconds! With an error of only 0.1% of full-scale value, this is a temperature controller of superior accuracy. Typically, readings have an error of ± 1 °C. TCP961's electromagnetic relay triggers heating, cooling or full-scale high and low alarms. It also retransmits an isolated output signal to other devices such as a Programmable Logic Controller (PLC) or Solid-State Relay (SSR). Signal isolation protects your devices and machines downstream of our instruments from damaging fluctuations in the input signal. TCP961 is conventionally an ON-OFF controller that outputs a discrete signal, but can also be used in Time-Proportioning Mode which turns the actuator on and off for periods proportional to the desired control effort, to emulate a continuous actuator that can generate a control effort between 0 and 100%. 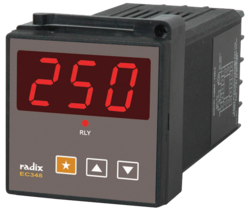 This product features Radix's proprietary sensor-break indication technology. Programmable Temperature Controllers, TCP962 is a mid-range programmable temperature controller; feature-rich and cost-effective at the same time. Designed specifically for applications requiring frequent set point changes, TCP962 features two push wheel switches on the front of the unit. It accepts input from 8 types of thermocouples (B, E, J, K, N, R, S, T), Pt100 3-wire RTD sensors, 0 - 10 V DC and 4-20 mA linear inputs. A single LED display shows the process value and 2 additional LED indicate the status of the two relays. Via the push wheel switch, operators can program 1 set point for the process value within seconds! With an error of only 0.1% of full-scale value, this is a temperature controller of superior accuracy. Typically, readings have an error of ± 1 °C. TCP962's programmable electromagnetic relays trigger heating, cooling or full-scale high and low alarms. It also retransmits an isolated output signal to other devices such as a Programmable Logic Controller (PLC) or Solid-State Relay (SSR). Signal isolation protects your devices and machines downstream of our instruments from damaging fluctuations in the input signal. TCP962 is conventionally an ON-OFF controller that outputs a discrete signal, but can also be used in Time-Proportioning Mode which turns the actuator on and off for periods proportional to the desired control effort, to emulate a continuous actuator that can generate a control effort between 0 & 100%. 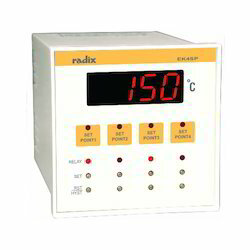 This product features Radix's proprietary sensor-break indication technology. Programmable Temperature Controllers TC72 is a mid-range programmable temperature controller; feature-rich and cost-effective at the same time. It accepts input from 8 types of thermocouples (B, E, J, K, N, R, S, T), Pt100 3-wire RTD sensors and optionally, 0 - 20 mA linear inputs and 4-20 mA or 0 - 10 V DC. A large LED dual-display on the front of the temperature controller shows the difference in values of the set point and process value while 2 additional LEDs indicate the status of each of the two relays. Buttons on the front of TC72 allow operators to easily program up to 2 set points for the process value. This is a highly accurate controller, with an error as low as 1% for thermocouples & no more than 0.1% for linear inputs.TC72's electromagnetic relays trigger heating, cooling or full-scale high and low alarms. It also retransmits an isolated output signal to other devices such as a Programmable Logic Controller (PLC) or Solid-State Relay (SSR). Signal isolation protects your devices and machines downstream of our instruments from damaging fluctuations in the input signal. TC72 is conventionally an ON-OFF controller that outputs a discrete signal, but can also be used in Time-Proportioning Mode which turns the actuator on and off for periods proportional to the desired control effort, to emulate a continuous actuator that can generate a control effort between 0 and 100%. This product features Radix's proprietary sensor-break indication technology. Programmable Temperature Controllers, TC48, is a mid-range programmable temperature controller; cost-effective as well as feature-rich. It also can be used as a programmable safety controller to perform on off action incase of emergency or overload etc. It accepts input from 8 types of thermocouples (B, E, J, K, N, R, S, T), Pt100 3-wire RTD sensors and optionally, 0 - 10 V DC and 4-20 mA or 0 - 20 mA linear inputs. 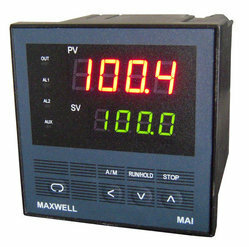 A large LED dual-display on the front of the temperature controller shows the difference in values of the set point and process value while 2 additional LEDs indicate the status of each of the 2 relays. Buttons on the front of TC48 allow operators to easily program up to 2 set points for the process value. With an error of only 0.1% of full-scale value, this is a temperature controller of superior accuracy. TC48's electromagnetic relays trigger heating, cooling or full-scale high and low alarms. It also retransmits an isolated output signal to other devices such as a Programmable Logic Controller (PLC). Signal isolation protects your devices and machines downstream of our instruments from damaging fluctuations in the input signal. TC48 is an ON-OFF controller that outputs a discrete signal, but can also be used in Time-Proportioning Mode which turns the actuator on and off for periods proportional to the desired control output, to emulate a continuous actuator that can generate a control output between 0 and 100%. TC48 is fail stafe for sensor break. The enclosure is a plug-in design, measuring 48 x 48 x 100 mm. 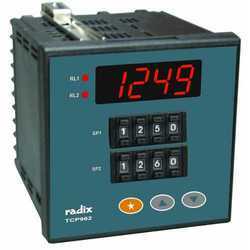 Programmable Temperature/Process Controllers, TEC201, is a mid-range programmable temperature controller; feature-rich and cost-effective at the same time. It receives input from 8 types of thermocouples (B, E, J, K, N, R, S, T), Pt100 3-wire RTD sensors and optionally, 0 - 10 V DC and 4-20 mA or 0 - 20 mA linear inputs. A large 0.8” (20.3mm) LED display on the front of the temperature controller indicates the process value while 2 additional LEDs indicate the status of each of the two relays. Operators easily program up to 2 set points for the process value via membrane buttons on the front of TEC201. It is a temperature controller of superior accuracy with an error of only 0.1% of full - scale value. TEC201's 2 electromagnetic relays trigger heating, cooling or full-scale high and low alarms. It also retransmits an isolated current or voltage output signal to other devices such as a Programmable Logic Controller (PLC). TEC201 is conventionally an ON-OFF controller that outputs a discrete signal, but can also be used in Time-Proportioning Mode which turns the actuator on and off for periods proportional to the desired control output, to emulate a continuous actuator that can generate a control output between 0 and 100%. TEC201 is failsafe for sensor break. The enclosure is a plug-in design, measuring 48 x 96 x 100 mm. Looking for Digital Temperature Controllers and Blind Temperature Controllers ?